One of the primary uses of wearables, like Smart Tags, is the data collection for event planners. The data collected by session tracking wearables can be used not only as feedback for future events by evaluating popularity, but also as a general method to gauge ROI. The more engaged your attendees were in using their wearables, the more successful your event probably was. This kind of engagement data collection is a major tool and resource for planners post-event, when planning for an annual event in the future, negotiating sponsorships, providing numbers for management and more. Wearables like Smart Tags have also become great tools for networking at events. Because of the NFC (near field communication) technologies, data is on hand. How many times have you attended an event and wished you had a couple more business cards on hand? Those days are long gone with technologies that speed up the process, and make connecting as simple as a handshake, or a tap of a button. Enhanced event wristbands that are integrated to enable cashless payments are strong and simple tools that leave attendees feeling more fulfilled in their event experience. Rather than carrying around a purse or misplacing a wallet, cashless payment methods in the form of wearables push the envelope. Modern and sleek, the experience is more seamless, quicker and more convenient for attendees, and there are few things attendees love more than knowing you value their time. Because NFC is activated within such a close-range distance, wearables are a more secure way of sharing data across attendees. Because the technology is physically near to the attendee, he or she has constant access and control to whose accessing their information. In terms of connecting, the attendee maintains control by deciding whether or not to push a button on the smart tag. 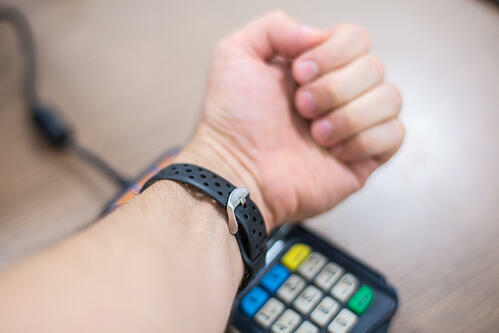 For cashless payment, the event wristband is visible and on their person the entire duration of the event. While it’s easy to misplace a purse, misplacing one’s wrist is a bit more of a challenge. These technologies leave the attendees with their data-sharing on their own terms, and your attendees will appreciate that sense of autonomy, control and security. The bonus reason to incorporate wearables into your next event? They save time, while saving the environment. By reducing the number of tedious, paper-centric tasks at your event—from nametags to business cards—you, as a planner, are making a difference, and encouraging your attendees to do the same. In turn, many attendees will appreciate both the efforts for sustainability and efficiency, raising your event success on a more emotional and personal level.